There are two different aspects of martial arts in this school: The first utilizes wide steps and long-reaching strikes, using more distinct and obvious movements. The second concentrates on shorter-ranged strikes and smaller stances and specialization close combat. There are many famous forms in Hong Quan. For example, Gong Zi Fu Hu Quan (Gong Zi refers to the I shaped layout of the form, while Fu Hu means tiger-taming), Hu He Shuang Shing Quan (Tiger-Crane Double Form), Tie Hsian Quan (IronThread Fist), Wu Chin Quan (Five Animals Fist), Wu Hsing Quan (Five Forms Fist) and Shi Hsing Quan (Ten Forms Fist) are all widely known. Weapons include the major weapons of Dao (or broadsword, a falchion-like single-edged weapon), sword, staff and spear. The more exotic weapons include double forks, folded fan, umbrella, bars with side handles and shafted blades. The basics of the forms include the Twelve Chiao Shou (Bridge Hands, arm symbolizing a bridge, as it is meant to make contact with the enemy) and the Twelve Chiao Ma (literally Bridge Horse, referring to stances). These, together with the following points of note, form the basis for the principles behind Hong Quan: Upright stances, stable Chi, sinking Chiao (bridge, meaning arms), swallowing waist, withdrawing body, and concentrating mind. Because there are many differing characteristics of Hong Quan, some theories change according to the specific animal form involved. For example, the Tiger and the Leopard are more gang aligned, or hard force oriented. Therefore, their practice will focus on the fierceness and exertion of strength, with the body staying upright, the stances being more regular, and the Chi flow more abrupt and forceful. These all contribute to the training of ones sinews and bones and help deliver force. The Snake form is more rou aligned, or soft flow oriented. The Chi should be sinking and smooth, and the movements and utilization of internal forces should be continuous, in accordance with the flows of Chi. The Crane form is concerned more with skill and its movements are mostly precise, agile maneuvers. The Chi is drawn higher with a clear mind, and the hand techniques utilize subtle differences in the palm and some angles formed by joints. 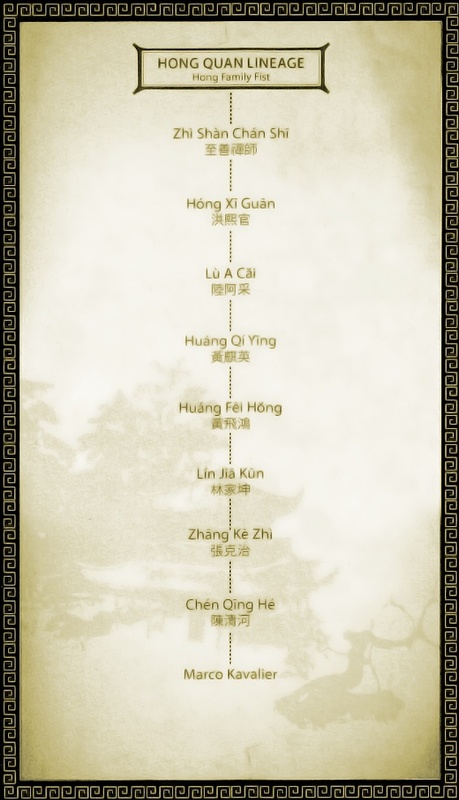 In general, the three treasures of Hong Quan are Gong Zi Fu Hu Quan, Tie Hsian Quan and Hu He Shuang Hsing Quan. Gong Zi Fu Hu Quan, according to legend, was created by Hong Shi Guan by modifying the Shaolin Form Eighteen Lohans Tame the Tiger. The layout of the form is H-shaped, and the Chinese character Gong looks like the letter H turned 90 degrees while Zi means written character in Chinese. Together these denote the layout of the form. It is the mostre presentative form of Hong Quan, and is mainly used to train Chiao Shou, Chiao Ma and develop Chi and internal force. It is known for its imposing moves and forceful strikes. The required standards for this form include: Sink the shoulder blades,spread out the back, send the forces deep into the bone marrow, use the body to moderate Chi flow, use Chi to guide and drive out force. So that such spirit may be felt: When one exhales, the shout shakes the mountains and the rivers, when one steps,the wind swirls the clouds up in the sky. Tie Hsian Quan is the form used most extensively to train internal force. It is a secret form that Hong Shi Guan obtained from the Shaolin Temple. The movements are wide and the stances low and spread apart. Its main characteristic is to use the body to moderate Chi flow, using the Chi to guide and drive out force. With the opening and closing of bodily movements, along side the twelve Chiao Shou guides, the interaction between gang and rou, coupled with using Chi to train the internal organs, it can effect the saying Internally, develop the Chi. There is also another legend which states that Tie Hsian Quan came from Tie Chiao San, a folk hero who is one of the famous Ten Tigers of Canton. It is a close-combat form that specializes in moderating internal organs with different emotional expressions, such as happiness, anger, sadness and joyfulness, to strengthen the body. According to legend, Hu He Shuang Hsing Quan is a form that was created by Hong Shi Guan after he met with Fang Yong Chun, a legendary female martial artist. It mainly adopts the forcefulness and power of the Tiger and the lightness, precision and agility of the Crane and merges them into one. From this union came a famous saying: When you combine Tiger and Crane, there’s no equal match found in all the world. Roughly speaking, this form is most noted for its numerous variations in hand techniques, steps and intricate uses of the torso. Combined with the characteristics of both Tiger and Crane, this makes it an application-oriented and multi-faceted high-level form. Why are these three forms called the three treasures of Hong Quan? Because Gong Zi Fu Hu Quan is a form that concentrates on the basics, offers sound training for stable hands and proper stances, and develops internal force. These form the basis for all further Hong Quan forms, so most people consider it the mother form of Hong Quan as well as its most representative form. Tie Shian Quan mainly trains the manipulation and strength of internal force, and is the best manifestation of the saying: Externally, train the sinews, bones and skin; internally, train the Chi. For this reason, Tie Shian Quan is called the highest treasure of Hong Quan. Hu He Shuang Shing is the form most oriented towards performance and application, so these three forms complement each other in an inseparable way. Among the forms of Hong Quan, there are two sets of forms each simulating five animals. The Five Animals Fist are form created in imitation of Dragon, Tiger, Leopard, Snake and Crane, while the Five Forms Fist include the five animal forms of Tiger, Crane, Dragon, Snake and Monkey. Both of these sets are considered mid-level forms in Hong Quan, and all are considered application-oriented forms. The keys to the Five Animals are: The Tiger trains the bone, the Leopard trains strength, the Snake trains the Chi, the Crane trains precision and the Dragon trains the spirit. The keys to the Five Forms are: The Tiger is forceful and trains the strength of the bone; the Crane is light and skillful, which trains the understanding of combat angles of both offense and defense; the Snake is gliding, winds around the enemy, and trains the sinking and continuity of Chi; the Monkey is accurate and sharp-eyed,and makes you swift and agile; the Dragon plays out the spirit and the mind fully, so it transforms and controls gang (hard) and rou (soft) completely. Thus, the Tiger is strong, the Crane is light, the Dragon combines hard and soft, the Snake is continuous in Chi and the Monkey is swift and agile. So another saying says: The Tiger is powerful as if coming down from a mountain forest, the Crane is ready as if resting on the branches and feeding, the Dragon is free as if roaming in the sky between clouds, the Snake is smooth as if gliding swiftly in the grass, the Monkey is alert as if dashing up a tree to grab fruit. Many of Hong Quans forms imitate the forms and spirits of animals, utilizing these in training with the following goal: Learn the forms, know the spirits, reach the true understanding. This is of the same principle as is stated in the Art of War: Face them with the normal and regular, overwhelm them with the strange and unexpected. Because there are different paths of training in Hong Quan, some concerned mainly with Chi and internal force while others attain victory from the application of various movements, they use different forms and their varying functions to offer the practitioner a choice to best fit his personal ideal, and raise his abilities by interchanging between different systems.